Are you going to join us for the Grand Opening of U.S. Bank Stadium in Minneapolis? If so, read on to answer all your burning questions about when and where to pick up your tickets, how to get to the gig, what NOT to bring and more. Take a spin through the FAQ and map below so that you’re prepared to have an awesome experience at the newest NFL stadium! IMPORTANT: PLEASE BE ADVISED THAT THERE WILL BE ELEVATED SECURITY MEASURES IN PLACE FOR THIS EVENT INCLUDING NFL CLEAR BAG POLICY. PLEASE CAREFULLY CHECK THE LIST OF PROHIBITED ITEMS AND ARRIVE VERY EARLY TO ALLOW EXTRA TIME FOR SCREENING. How is the best way to get to U.S. Bank Stadium? We strongly recommend public transportation, taxi or ride share. The taxicab stand is located on the east side of Park Avenue S, between 5th Street S and 6th Street S. The Taxicab stand is operated throughout the entire event and remains open up to one hour after the event’s conclusion. While U.S. Bank Stadium makes every effort to reduce wait times at the stand, wait periods may vary subject to local taxi volume. U.S. Bank Stadium is located at 401 Chicago Avenue S, Minneapolis, MN 55415. U.S. Bank Stadium does not currently own any parking spots. Between the stadium and Hennepin Avenue (20 minute walk zone), there are six parking ramps and/or surface lots that are accessible for all guests to park in with over 20,000 spaces. When driving to the stadium, we encourage all guests to not circulate around the stadium looking for parking, but instead stay in the area you exited the highway to park. Specific drop off and pick up locations are as follows: Uber, Lyft (located on 10th Avenue S), ADA Drop Off (10th Avenue S), charter bus parking (7th Street) and Taxi Cab pick up/drop off (Park Avenue). U.S. Bank Stadium encourages guests to utilize bicycle transportation when visiting the stadium. Bike racks can be found along the exterior of the stadium in the North East, North West, and South West sides for you to park and lock your bike while visiting the stadium. There will be no bike check available. When can I start lining up? Ticket holders may start lining up first thing in the morning as long as you are not obstructing traffic. Those with GA floor tickets should line up at the Ecolab Gate, which is on the North side of the stadium. What time does the show start & end? The show begins at 6:00 PM with Volbeat, followed by Avenged Sevenfold and then Metallica. The show will be over at approximately 11:00 PM. Where is the box office located to pick up will call tickets? General Attendee Will Call is at the U.S. Bank Stadium Box Office on the North West side of the stadium, along Chicago Avenue S and 4th Street S.
On Saturday, August 20th the box office will open at 8:30 AM for will call and guest list pick up. There will be a dedicated window for Metallica Fan Club. May I bring my kids? Do they need to have their own tickets? Yes. Children over the age of two need to have their own ticket for entry. NFL CLEAR BAG POLICY WILL BE IN EFFECT. ONLY CLEAR BAGS OF THE SIZE OF 12” x 6” x 12” OR SMALLER WILL BE ALLOWED. NO OTHER BAGS ALLOWED INCLUDING PURSES, BACKPACKS, FANNY PACKS, CAMERA BAGS, DIAPER BAGS, COOLERS, AND BINOCULAR BAGS. Purses, backpacks or any other bag that is not clear. Guest are welcome to use still cameras for personal use at U.S. Bank Stadium. Tripods, monopods, “selfie sticks” and cameras with a lens longer than 6” (detachable or non-detachable) will NOT be permitted into the stadium. Video cameras and video recording of the event with other devices at U.S. Bank Stadium are prohibited. If I bring something that is not allowed, is there somewhere to store it other than an automobile? 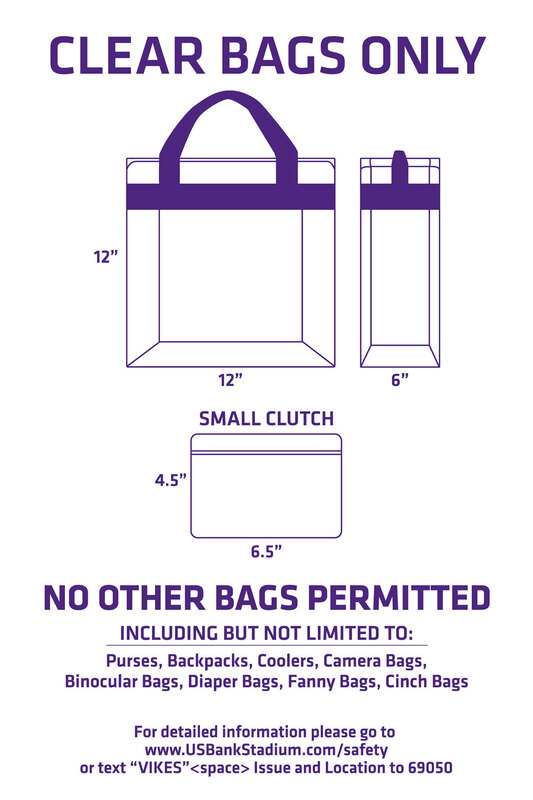 No, the item will not be allowed in U.S. Bank Stadium and there are no bag check services or storage lockers. What gates will be open? All entrances will be open at 4:00 PM on show day. **We highly encourage all attendees to arrive early, as there will be increased security checks at the entrances. Security coverage will be very high at this event, so please allow extra time for the magnetometer screening and bag checks upon entry. Is there a separate entrance for GA tickets? Guests with GA tickets will need to enter through the Verizon Gate on the East Side of the stadium. Wristbands will be issued on the SE corner of the stadium (near the Verizon Gate) and guests will be escorted down to the field from there. Are there special entry gates or other services for disabled guests? Each entrance is equipped for disabled guests. We encourage guests who need to utilize our accessible drop-off (10th Avenue S, between 6th Street S and 7th Street S) to enter through the Pentair Gate on the South side of the stadium. Please contact the venue no later than the night before the show to obtain access to ADA seating areas. Will there be food and beverages for sale at the stadium? Yes, a wide variety of concession stands will be open inside U.S. Bank Stadium throughout the concourses of each level of the stadium. Will beer and/or other alcohol be sold? Is there a cut-off time? Yes, beer and alcohol will be sold inside U.S. Bank Stadium. Cut-off time TBD. No, tailgating is not endorsed and will not be provided by U.S. Bank Stadium for this event. Will official Metallica and show merchandise be sold at the event? Merchandise will be located inside the stadium at the following sections: 101, 110, 114, 119, 124, 131, 137, 138, 142, 300, 303, 312, 327, 330, 341, 347. Will I be able to purchase a recorded copy of the show? Yes, the professionally recorded and mixed show will be available for download and/or on CD within 72 hours of the show. You can pre-order the show on CD at Metallica.com and pre-order the digital download at LiveMetallica.com. Video recordings will not be available for purchase. I heard there is going to be a Pop Up Store! Is that true? Come check out the official Metallica Pop-Up Store this weekend for exclusive show merchandise celebrating our performance at the Grand Opening of U.S. Bank Stadium! In addition to that, we’ll also have items you won’t be able to find anywhere else (not even inside the stadium!) as well as a wide selection of classic Metallica merch. While you’re there be sure to enter our Pop-Up Store Contest for your chance to win cool prizes!